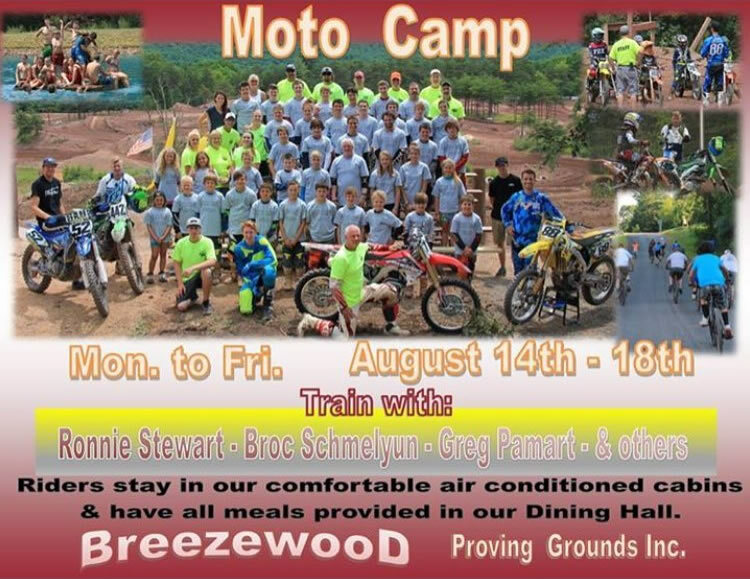 Moto Camp Bike Week is a 5 day camp focusing on Motocross Racing Skills taught by Pro Trainers and Racers. Riding skills will be tested and evaluated on the first and last day of camp. All aspects of Motocross Training will be covered. Riders can expect a lot of training time and open riding time on all tracks. We will have a fun schedule of activities including a swimming cook out, trail rides, a guest speaker and awards for personal accomplishments. This is the camp that everyone wants to be at sign up before the camp is full. Pro Racers Ronnie Stewart, Greg Pamart, Broc Schmelyun and more pro’s to be announced.